On the set of a documentary shot in Ireland in 2016, featuring SLU professor Thomas Finnan. Time has a way of erasing what came before, often pushing lived history underground. 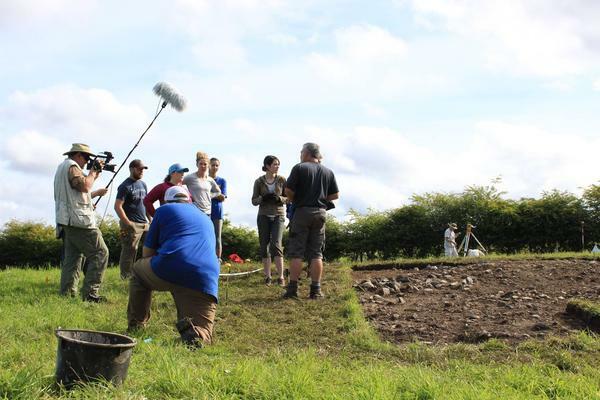 A new documentary from HEC-TV that will premiere this fall follows the effort of one Saint Louis University professor and archaeologist as he and his team aim to uncover a specific piece of Irish history: the remnants of Gaelic lordship from the Middle Ages. Gaelic Ireland refers to the era from around 1200 to 1700, or the late medieval period. The film will have its premiere on Sept. 28 at the Center for Global Citizenship at Saint Louis University. More details on that here. That means Finan’s team was almost literally looking for sewing needles in haystacks and other pieces of evidence of Gaelic life. His process is indefinitely aided by the use of technology, which plays a large part in the film. A new documentary explores Ireland of the Middle Ages and a SLU professor's work to uncover the history of lordship there. St. Louis on the Air host Don Marsh speaks with the subject and the filmmaker of "True Gaelic."